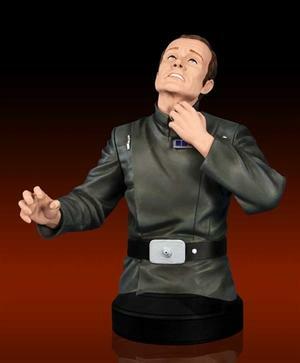 Admiral Motti was head of the Imperial Naval operations aboard the Death Star. Motti was overly-confident in his belief that the Death Star was invulnerable to any threat posed by the Rebel Alliance. He was even arrogant enough to openly question Darth Vader for his failure to locate a secret Rebel base. For this, Vader Force-choked Motti, only to have Grand Moff Tarkin intervene at the last moment, ordering the Dark Lord to relent. This highly-detailed mini bust, based on the original Lucasfilm costumes and props, was sculpted and painted by Gentle Giant Ltd. Includes a numbered certificate of authenticity autographed by actor Richard LeParmentier.